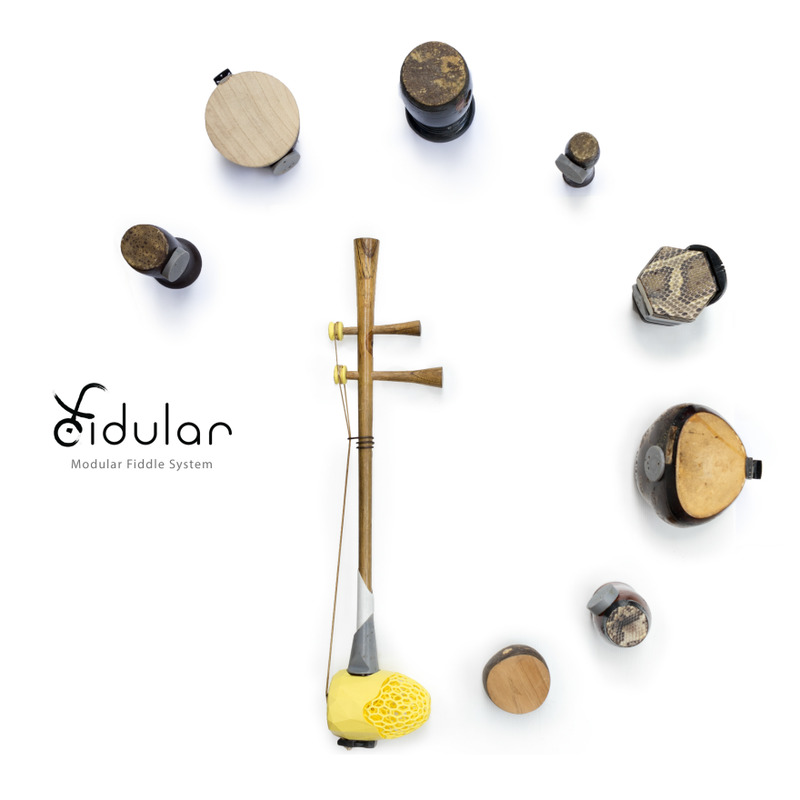 Fidular is a cross-cultural, modular system designed for traditional bowed fiddles. With unprecedented cross-compatibility, users can instantly dissemble and interchange chamber, strings and shafts between various fiddles from across Asia and the Middle East. 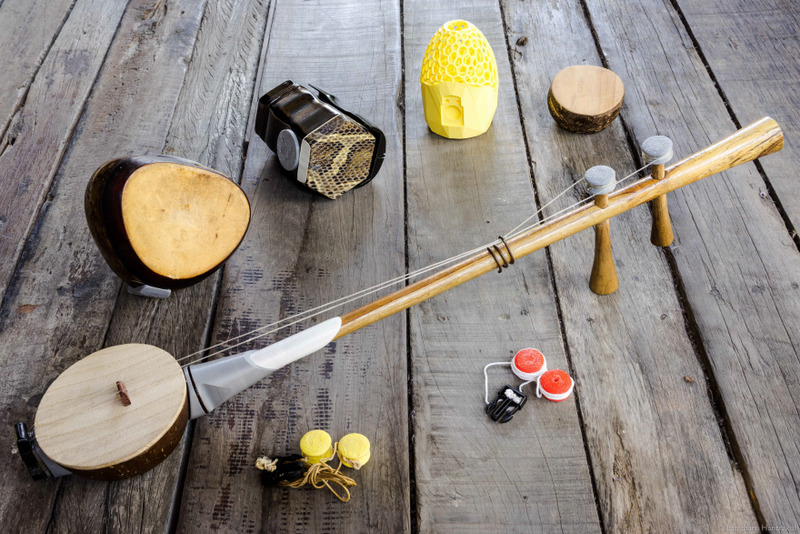 Whereas traditional fiddles are permanently bonded together, Fidular features a re-designed frame, enabling a musician to easily remove and swap the mellow coconut of a Thai Saw-U for the sharper lizard skin chamber of a Vietnamese Danho, or even a 3D printed chamber, all while retaining the delicate silk strings of the Korean Haegum and critical acoustic phenomena. Aspects such as timbre can be customized by mixing and matching traditional chambers or by creating new designs through digital fabrication. The serendipitous inspiration behind Fidular came from my apprenticeship with luthiers in Northern Thailand. As I practiced chopping coconuts and carving wood on a DIY carpenter's lathe, I thought about how scientific tools and fabrication methods have continuously evolved Western musical instruments in incredible ways: from 3D printed flutes, carbon fiber violins to hybrid acoustic-digital guitars. On the other hand, the design and fabrication of traditional musical instruments, like the Thai Sloh I was making, have remained unchanged for centuries. 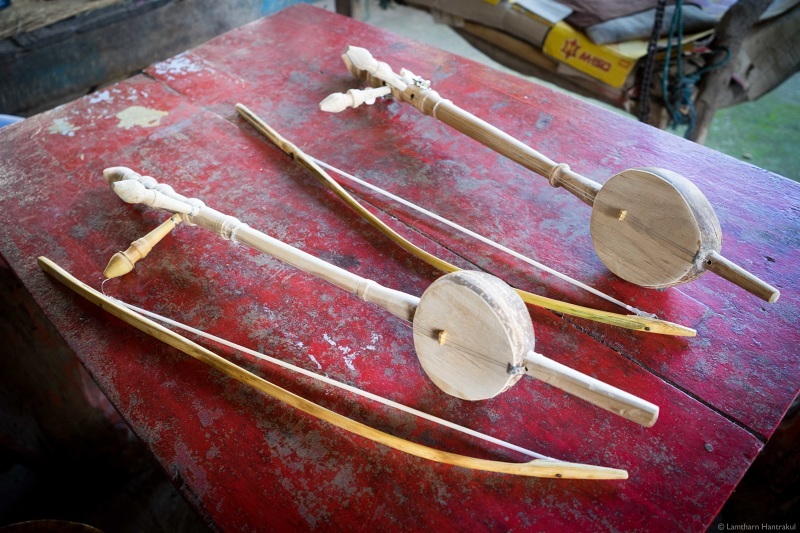 Lack of research, coupled with declining interest in traditional music, has left traditional instruments like the Iranian Kamancheh, let alone the relative unheard-of Thai Saw-U in a state of innovation "stasis". 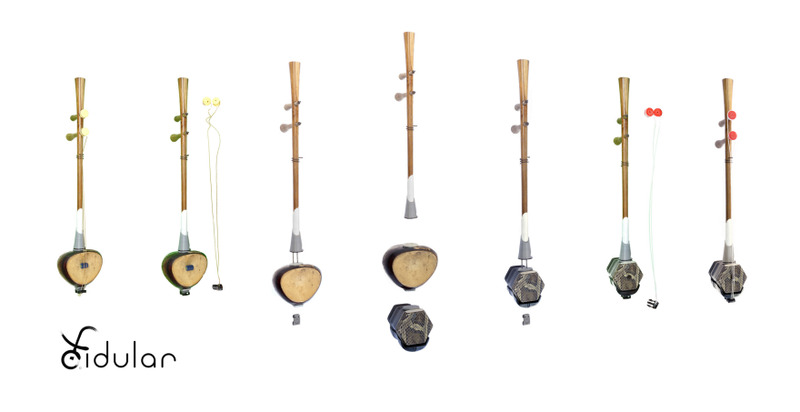 Inspired by recent advances in digitally fabricated instruments, I wanted to re-imagine traditional instruments with these new technologies and audiences from my home country, Thailand, and across Asia. Fidular embraces the notion of cultural plurality as a design principle. While the Chinese Erhu, a traditional two string instrument from China, is now a familiar instrument on a global scale, it is just one type of fiddle belonging to a larger family of bowed fiddles found across Asia to the Middle East. The distinct timbre of a fiddle is determined by the culture's unique combination of materials and geometries, the Erhu for example is made from snakeskin stretched across a hexagonal chamber. However, because traditional fiddles are permanently bonded together, there is no opportunity for the end-user to modify, experiment or improve the instrument once the luthier has finished his craft, let alone swap parts with another fiddle. Through my first-hand experience building these instruments, I identified and re-designed components common across all fiddles to enable both modularity and cross-compatibility between cultures. 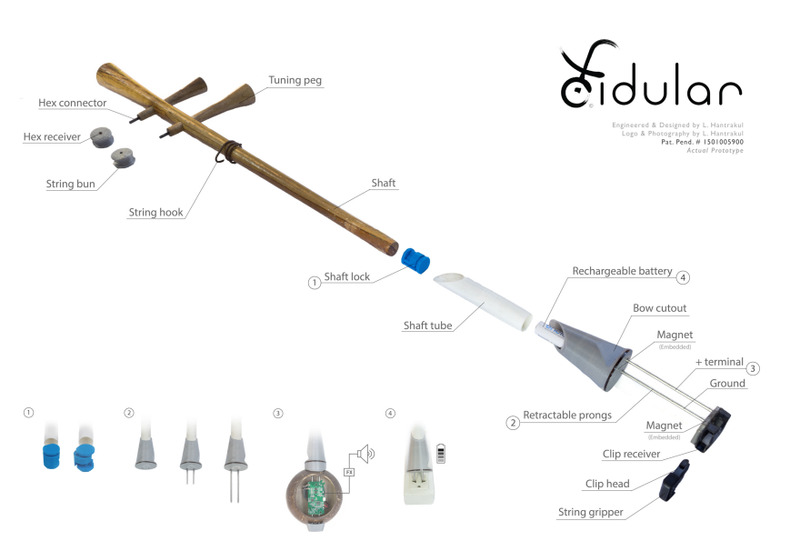 The design, engineering and fabrication process was informed by interviews with fiddle makers from different countries, professional musicians, professors, regular folk and concert goers, as well as the creator's own background in Applied Physics (B.S) and traditional Thai music. Fidular manifests my vision of culture-aware technology: the convergence of future and traditional technologies, engineered for cross-cultural fluidity. It unifies the plethora of fiddles from across Asia and the Middle East into one integrated cross-cultural system. Musicians can use different combinations of chambers and strings to modify the fiddle's timbre and acoustic "personality" according to or beyond its country of origin. The process becomes much like changing lenses on a DSLR camera. A photographer owns a collection of lenses as each one imparts a unique visual character and perspective to the image. A fiddle player with cross-cultural chambers can choose the one most appropriate for a particular style. The mellow tone of the Thai Saw-U chamber is particularly apt for many expressivo passages while the higher tone of a Chinese Banhu may be more suitable for vivace passages. I imagine players visiting different luthiers, collecting chambers and developing particular bonds with a chamber's acoustic qualities. With modern communication and digital fabrication, I also see musicians designing, sharing and downloading personalized chamber designs across FabLabs. My vision of culture-aware technology extends beyond musical craftsmanship and 3D printing. Imagine Thai silk and Indonesian Batik woven with conductive thread and activated with capacitive sensing, or Cambodian silver bracelets embedded with wearable computation. My two pending patents and published papers on Fidular demonstrate how applying cutting-edge technologies in new cultural contexts, can lead to novel and surprising results that can advance technology and design. I am currently exploring this vision in the domain of Artificial Intelligence and Deep Learning, applied to Southeast Asian and East Asian culture. Technology can be made better for all users; from all cultures. Compatibility: Fidular must be "backwards compatible" with traditional chambers and "forwards" compatible with chambers made from digital fabrication or new materials. Acoustics: Fidular must preserve the original acoustic mechanisms and eigenmodes specific to each chamber. Modularity: Fidular must allow the user to easily access and change components, specifically strings and chamber. Form: Fidular must retain a form close to the original design of traditional fiddles. Permanent joints between shaft and chamber were redesigned for compatibility across various chambers. Traditionally, a long shaft penetrates the top of the chamber and protrudes out the bottom. The strings are tied onto the downwards protrusion and stretched upwards to the shaft's tuning pegs. Early designs featured a frame with a hollow center and suspension for the resonators. However, this was unable to accommodate the variety of chamber shapes ranging from tubes, hemispheres and asymmetrical coconuts. A second iteration placed a "C" frame around the chamber (see supporting images), with an adjustable screw securing the base of the chamber. However, the process of screwing was deemed inelegant, and the external frame too divergent from traditional fiddles. 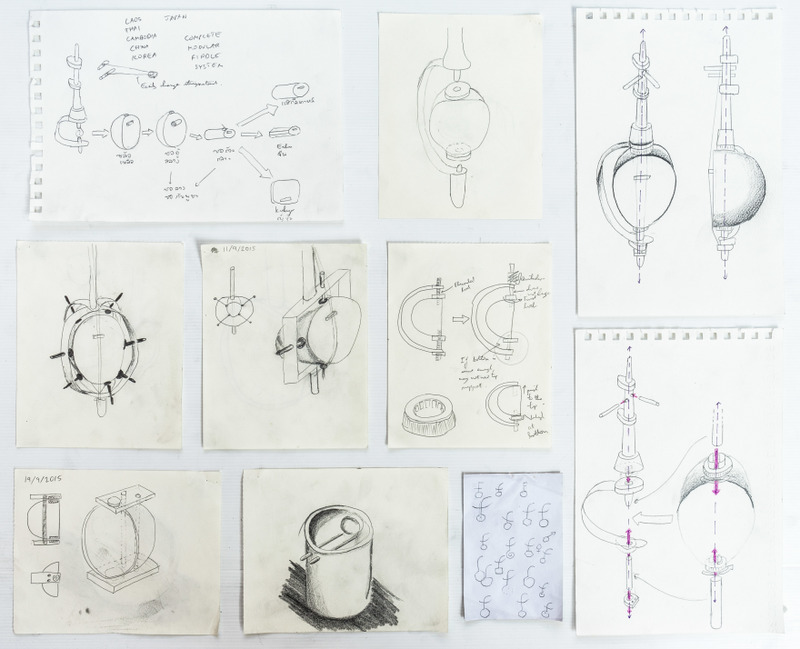 The final design places parallel aluminum prongs inside the chamber, which in turn protrude out from the chamber to connect to a custom 3D printed base and wooden shaft. This solves the problem of differing heights, since the prongs are proportional to chamber height. The parallel prongs prevent the shaft from rotating about the chamber and serve as +ve and –ve terminal for powering integrated electronics in future chambers. This enablesFidular to connect with a wide variety of traditional chambers, whilst being compatible with new ones, such as the 3D printed chamber with interchangeable front panels demonstrated in the video. Since the physics strongly motivates Fidular's design, a brief overview is summarized here (published paper in supporting PDF). Prior to this work, no publications existed detailing the acoustic mechanisms on how fiddles produce sound. The author drew many conclusions on the acoustics of fiddles by comparing it with the well-studied acoustics of violins. Briefly, both instruments produce sound by first vibrating the strings using a constant force supplied by the bow. Both fiddles and violins use specially designed bridges that transfer vibrations from the string to the wooden body of the instrument. In a violin, the entire wooden body vibrates, filtering and amplifying the signal from the strings. The chamber of a fiddle however, is too thick to vibrate and thus only the stretched skin on the chamber vibrates. The sound then travels through the chamber like an air column. When asked about specific column geometries, the Vietnamese luthier, Sua Chua, described how it "compressed" and "expanded" the sound waves. The Korean luthier, Ryu Cheong Seon, expressed similar motivations. These qualitative descriptions, coupled with acoustic theory, support the function of fiddle chambers as a "waveguide", which coincidentally, is routinely used by acoustic engineers to increase off-axis response of speakers. Thus as long as the panel skin can vibrate freely, the chamber can be modified with the parallel prongs and shaft mechanism without disrupting the waveguide nor skin eigenmodes. Beyond wood and coconuts, the designer is also free to use tubes and chambers with new geometries from 3D printed polymers or machined composites. The user must change strings in order to change the chamber. 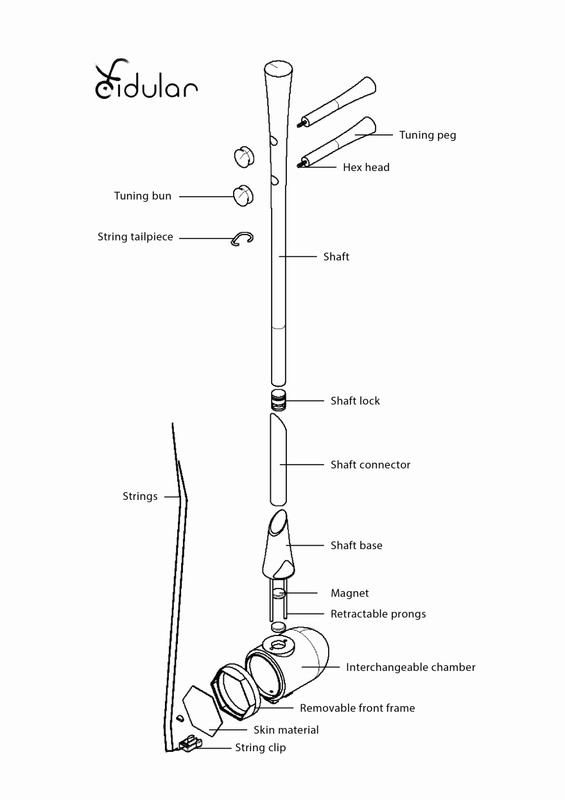 The string is traditionally tied or threaded through the protruding shaft at the chamber base. Some instruments like the Chinese Erhu have more modern metal mechanisms, but in all cases, the strings are not easily removed. Fidular uses an injection-molded push-clip mechanism that can be conveniently clipped and unclipped at the base of the chamber. On top of the shaft, the strings are traditionally threaded and wound around tuning pegs, much like a violin. Initially the tuning peg was separated into two parts connected by a slat so users could slide a new peg with different string materials. The final design wraps the strings around a 3D printed "bun" which slides onto the tuning peg using a hex tip and is able to withstand strong rotational forces. The tuning pegs are held by friction like a traditional fiddle. Using this mechanism, the transformation process from one fiddle to another takes under a minute to complete (supporting video). In tandem with the spirit of being "backwards" and "forwards" compatible, I strived for a design that would appeal to older, "conservative" musicians and luthiers whilst sparking excitement for "millennials" like myself. 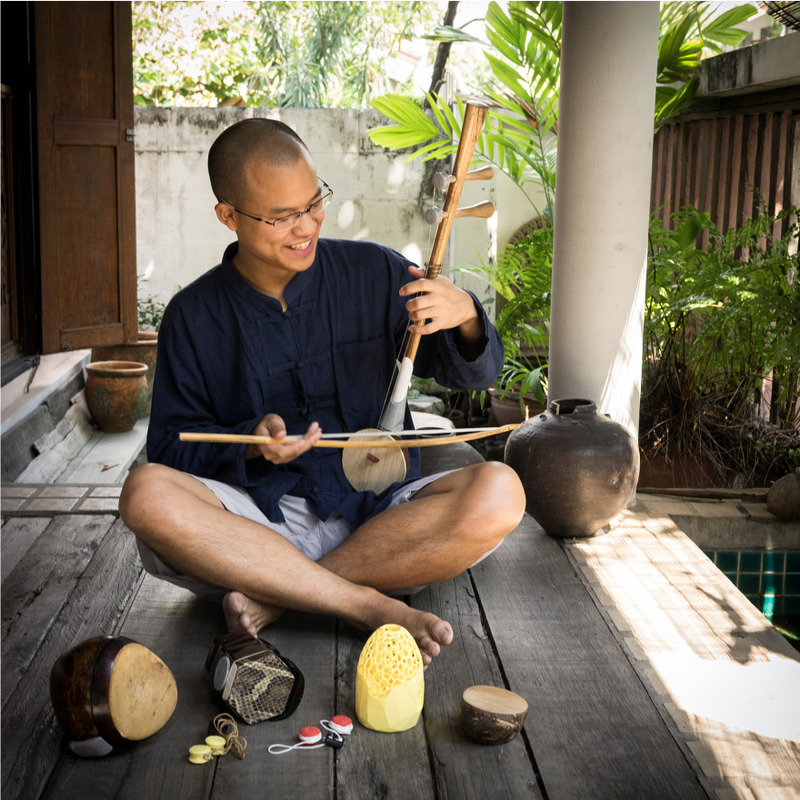 A professional fiddle player from Northern Thailand stressed how the instrument must not only "sound" like an Erhu, it must also "feel" like an Erhu. I addressed this challenging balance by hiding new modular joints inside the shaft and chamber to retain the familiar look of traditional fiddles. Fidular's core structure uses a combination of crafted wooden components, 3D printed and laser cut pieces best suited for the part's complexity, tensile strength and aesthetics. The connecting base between chamber and shaft was designed on CAD software and 3D printed with PLA to ensure precise alignment of the prongs. Aluminum prongs are lightweight and electrically conductive. To ensure strength and artistic familiarity, the shaft and tuning pegs were carved from teak with supervision from my luthier teacher, Khet Chaikam. The Sloh chamber was made from chopped dried coconuts glued to a wooden panel. The 3D printed chamber and front panels used PLA. Other chambers were removed from their respective fiddles and lightly modified with 3D printed parts to align with Fidular's shaft mechanism. Since its premiere during my keynote at the SEASAC Arts and Technology conference (January 2016) and subsequent exposures at invited talks and maker faires (February, May, June 2016), Fidular has attracted a wide range of positive commitments from local craftsmen, musical foundations, professional musicians and educational institutes of design and technology. My luthier teacher was most impressed by the "ability to change quickly between different fiddles". Another luthier remarked how "alternative materials can be easily incorporated once wood becomes a scarce resource". Fidular integrates with a luthier's existing craft whilst leveraging the increasing availability of digital fabrication tools accessible to the end-user. As encouraged by professional musicians at Luang Praditpairoh Music Foundation (Thailand) and engineering professors at Ladkrabang Institute of Technology (Thailand), emerging plans to commercialize Fidular can propel industries where craftsmen, engineers and consumers merge across technologies and generations. From a scientific perspective, Fidular serve as a platform to easily mount and test various chambers. This can facilitate acquisition of much-needed spectral data in the acoustics domain. Fiddle makers can use Fidular's modularity to experiment with various materials without having to rebuild a new fiddle each time. Personally, I was most delighted by a young boy's response in Northern Thailand "I never thought traditional musical instruments could be so cool!" A teacher in a nearby village said "my students are not interested in the Thai Sloh anymore, but if they saw your project, I think it may light their interest". Response from audiences at invited talks have been equally enthusiastic and positive. The few negative ones, when they occurred, were all from adults who felt that digital fabrication in general, was somehow "un-Thai" or "not the traditional way." It is my hope that projects like Fidular can re-invigorate interest in traditional cultures, particularly among the youth, by pushing its boundaries into cutting edge domains of technology and design.